Award-winning underwater photographer Douglas Hoffman shares his approach to capturing shark images. I had the pleasure of exchanging a few emails with Douglas after reading his story in the Maui News. He was interviewed as a result of donating shark photographs to the Humane Society International for use in a campaign to end shark finning. 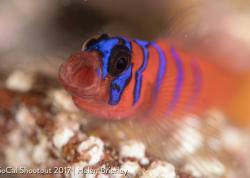 I asked him a few questions about how he achieves success in his underwater photography. 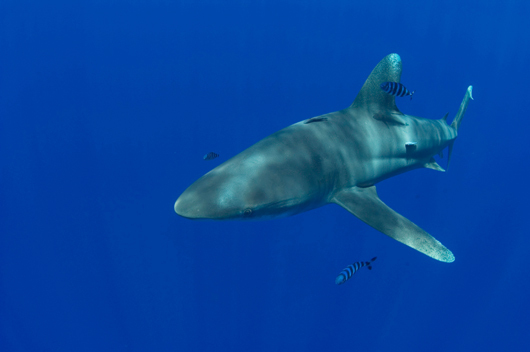 Oceanic White Tip shark in Kona using a Nikon D100 in a Nexus housing, 16 mm fish eye lens, F7, 1/200th. No flash. Photo by Douglas Hoffman. MZ: Is there a particular mindset that you have when you enter the water with the sharks? DH: I feel a sense of excitement. 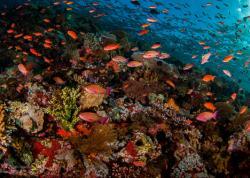 I know that each dive is different and that I will see different sharks. Before getting into the water I double check that I have turned both strobes on, and that the camera is on and set up the way I want. This means the ISO is at 320 or 640, the metering is on spot, and the drive is on single servo. For sharks I tend to use Shutter Priority mode and set the speed to 1/250th. In this mindset I am hoping to freeze the sharks but also the sun's rays. Other times speed is not as important and I use Aperture Priority mode and set the camera at F8 and let it determine the shutter speed. In this way, I can get good depth of field. This is good when I am doing an environmental style portrait and want to show sharks in the foreground and background. 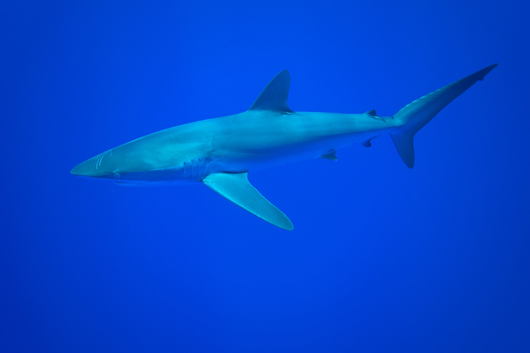 Requiem shark in Tonga. Nikon D300 set at -3 exposure compensation, Nexus housing 12-24 Nikon lens F4.5, 1/200. No flash. Photo by Douglas Hoffman. MZ: Do you have an idea of what shot(s) you're hoping to capture, or do you seize each moment as it happens? DH: While I have images I would like to capture, the dives are not scripted and anything can happen. It would be great to have a 15 foot tiger come by and give the camera a good look but I have learned that you get what you get, so don't get upset. There are many variables that come into play and all of them effect the success of the dive. Some include current, turbidity, visibility, tidal exchange, time of year, water temp, as well as the number and variety of species of shark in the area. When photographing sharks my goal is not to get the Jaws-style in-your-face-and-make-you-scared photograph, rather it is to show an apex predator in its environment. I want to show the beauty of sharks and help raise awareness that sharks are the barometer of a healthy ocean and should be protected. 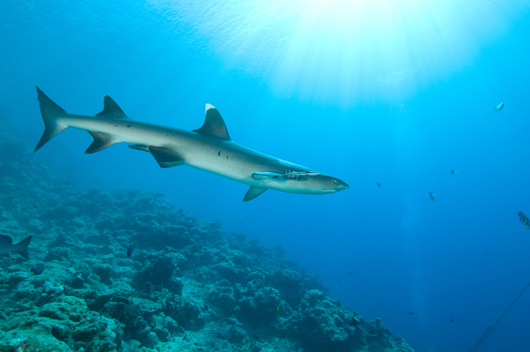 White Tip Reef shark in Fiji. Nikon D300 set at -.3 exposure compensation, Nexus housing 12-24 Nikon lens F9, 1/200. l. Strobes are Ikelite DS160 model set on -2 power. Photo by Douglas Hoffman. MZ: Any "preset" settings you use before you jump in, just in case an opportunity presents itself (e.g. 1/125, F8)? DH: I usually go in the water with the camera set on Shutter Priority. Once I see the actual behavior I might switch to Aperture Priority and set the camera on F8. 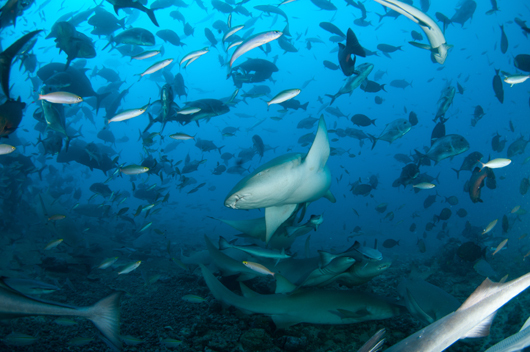 Nurse shark created in Fiji. Nikon D300 at -.3 exposure compensation and Tokina 10-17 lens. F5.6, 1/100th. Two Ikelite DS160 flashes set on -3 power. Photo by Douglas Hoffman. MZ: Any particular equipment you use a majority of the time (e.g. scuba vs snorkel, etc)? DH: I use scuba. It feels good to have a tank on my back. The bubbles and metal give me a sense of security. I use a Nexus housing and Nikon D300 body. Either a 12-24mm Nikon lens or a Tokina 10-17mm fisheye lens. I use 2 Ikelite DS160 strobes with custom diffusers. The power is set at minus 3. 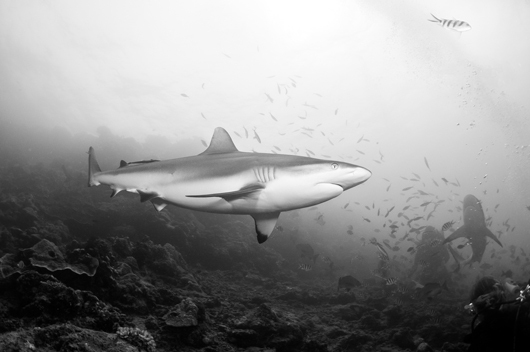 Grey Reef shark in Fiji. Nikon D300 body set at -.3 exposure compensation and Tokina 10-17 lens. F9, 1/250th. Two Ikelite DS160 flashes set on -3 power. Photo by Douglas Hoffman. 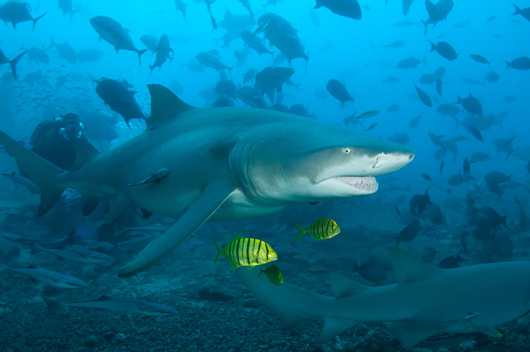 Lemon shark in Fiji. Nikon D300 body set at -.3 exposure compensation and Tokina 10-17 lens. F7, 1/100th. Two Ikelite DS160 flashes -3 power. Photo by Douglas Hoffman.